Stephanie Jones is an active soloist and chamber musician who is currently based in Germany. She has recently finished her Masters and is currently studying a Konzertexamen in Classical Guitar Performance with Thomas Müller-Pering at the prestigious University of Music Franz Liszt. Stephanie won first prize in both the Uppsala International Guitar Festival Competition and the Hannabach Guitar Competition. 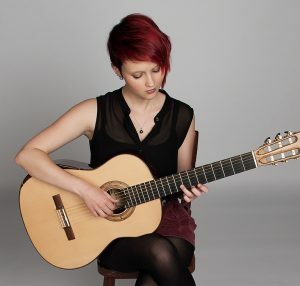 She was also a finalist in the Deutscher Gitarrenpries and the Salzburg International Guitar Festival. In 2014, through the Fine Music Network National Competition, Stephanie was awarded the Young Virtuoso of the Year. In 2012, Stephanie competed in the prestigious Adelaide International Classical Guitar Competition and subsequently won second prize. Stephanie has performed extensively around the globe, including three Australian tours, a New Zealand tour, and with the Weimar Guitar Quartet, a Germany and Slovenian tour. She continues to travel regularly for both international concert and festival invitations. Stephanie plays Hannabach Goldin strings on a Paul Sheridan guitar from 2012 and a Daniel Zucali guitar from 2015.